New Year's Eve, 2008. The last day of the year. And what a year it has been. Today we're having a family day. I think my days of partying 'till dawn on NYE are over. Gosh I could tell a tale or two about those times!! I did some crazy stuff in my young single days. Today we're taking the kids to the NYE "noon" bash at the New Orleans zoo. Then tonight we're going hang out with friends for as long as the kids will let us. We'll likely be home by 8 or 9pm, lol! I am glad 2008 is over. I usually go back and read over my entries and write a year in review post. I can't do it this year though. I can't relive those memories right now. The year has passed me by and much of it is a painful blur. No need to say it -- but this has been a difficult year for me, if not THE most difficult year thus far. The first four or five months were typical, happy even. I never expected things to take such a downward spiral. I never expected many months of grief and sorrow. I never expected to feel so broken. It has definitely been a learning experience about myself and others. Death is such a sad way to learn though. Such is life I guess and you should always expect the unexpected. I just never fathomed any of this would happen. It's kinda nice to start fresh every January. A new calendar... a blank page. Time to introduce the new and improved Me. I'm not sure what I hope 2009 brings. Peace perhaps. To find peace. For my heart to heal. For the heaviness weighing me down to lighten. More quiet instead of chaos. Normalcy. Brighter days. Fewer tears and fewer sleepless nights. A little less heartache and a little more happiness. Mostly I just hope that 2009 is better than 2008. Maybe that's asking a lot. I can hope though, can't I? Well, I don't have much to write about today. I could gripe about Dell not repairing my laptop. They sent it back and didn't fix the issue. Clint had to spend an hour on the phone with them again. Or I could write about a few other on-going issues involving those that shall remain unamed! But you know... if you can't say anything nice, don't say anything at all. Stupidity can be quite entertaining. I got my laptop back from Dell today. Yay!! I haven't a clue if the issues are corrected, because Clint has yet to install the hard drive. But anyway, that's not the point here. Under my computer there was someone else's Repair Depot Tech Notes. "Internet Explorer stops responding, gets very hot on the motherboard and the hard drive, battery only stays charged for 30 minutes, and time is set to Greenwich Mean time, I am in the US Eastern time zone. If you cannot repair these issues this time I want a replacement or a full refund!!!" I had to read it twice. Ok three times to be sure I understood the "issue." Really.... this person returned their laptop to Dell for repair because the TIME is wrong?? IE crashes?? It gets HOT?? I almost wish there were an email address so I could drop them a line and say thanks for the laugh. Clint, reading the box: "My Little Pony Rainbow Bath set!" Val: "I really love it! Um, who is that from?" Me: "Pumpkin, that's from MeMe. She bought that a long time ago"
Val: "Um I will say thank you for MeMe at heaven. Thank you MeMe!! I love it! and I like it!" Thankfully I am feeling MUCH better today!!! The kids... Val seems ok. Roni, I'm not so sure. I hope we can stay out of the doctor's office next week. I can't believe Christmas is over. I watched our Christmas video with the kids today. They sure had a great time. We are 99% De-Christmassed, if that is even a word, lol! We packed up the tree and most of the inside decorations today. We need to buy another storage tote to put the new things. My house is a complete mess. It's ok though. Slowly we'll get things back in order. Clint is off all next week, so I'm sure I will be putting him to work. Next I have to figure out where to put all the new toys. Hmm. Overall I feel much better than yesterday!! I spent most of yesterday in bed! My fever finally went away. My throat is hurting still and I'm pretty sure it's turning into strep. So, if it's not better tomorrow or Sunday, I'll be heading to Urgent Care. I did get out early today for a little after Christmas sale shopping!! Clint bought all new lights to decorate the house next year. I picked up a few inside decorations, some makeup brushes, and a manicure set for me. Did Santa bring enough stuff or what??? Merry Christmas, everyone. I wish you all the best this holiday has to offer! Veronica has a sinus infection. Let's see.... guess who's next?? Why none other than ME of course. I started feeling run down last night after presents. Then my throat started to hurt. 101 fever during the night. Hot/Cold/Hot. Today I'm achy and really really tired, and my throat has the lovely spots just coming out. Yay me. Christmas Eve went well. The girls had a GREAT time. It was so fun watching them rip open the presents. I was okay until Valerie unwrapped something my Mom had bought. After she died, we found a few gifts she had stashed away for the kids. I had my Dad wrap them. When Val opened hers, a My Little Pony bath set, I told her that MeMe had bought that for her long ago. Val got so excited! And said, "I gonna tell her thank you in heaven!" And she looked up and said just as sweet as you please, "thank you, MeMe." It was all I could do to fight back the tears. I can't believe it's Christmas Eve already. Christmas is here. 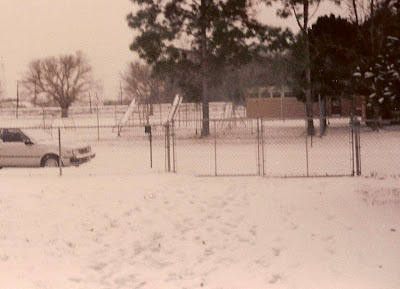 When I was little, we went to my Grandma's on Christmas Eve. 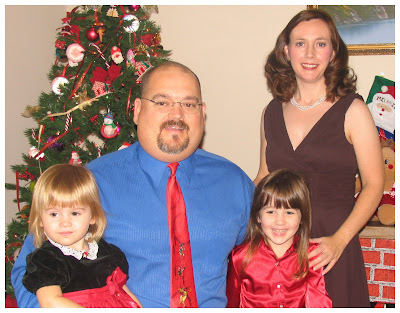 First though, we'd dress in our best , take pictures in front of the tree, then open our gifts under the tree at home. My Mom always said this was to keep Santa's gifts and their gifts separate. 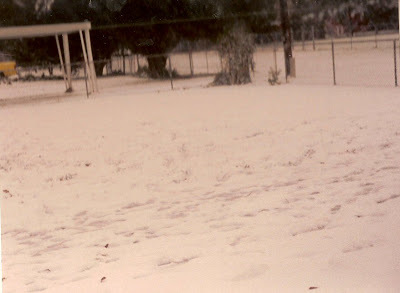 Then we'd head to my MawMaw's for some holiday cheer. Everybody went. Everybody. All the Aunts, Uncles, Cousins, close family friends. If they knew our family, they were there. We'd have party food galore. The kids would play. The adults would gossip. My Uncle would tell us he heard sleigh bells outside! Then we'd all open gifts. I don't remember ever getting more than 2-3 gifts, but that was fine with me. I was always bursting with excitement anyway. After what seemed like many hours, we'd head home and go to bed. Notice I didn't say sleep!! I barely slept most Christmas Eve nights. Too excited at the prospect of what Santa might bring!! And usually I'd creep out to check during the night and there would be nothing under the tree. At about 5am when I could stand it no more, and I'd be up to discover what Santa had brought. Gosh, how my Mom must have hated that!!! My Mom told me that usually she had JUST put everything out when I'd decide to get up. LOL! As the years went by and more and more babies came along, my Grandpa passed... so Christmas at MawMaw's was no more. My Mom decided that we would do it at our house - but just the three of us. And that's the way it has been every single Christmas. Until now. My Dad is coming to our house tonight. We're having our usual party fare: chicken salad sandwiches, cocktail meatballs and sausage, devilled eggs, chips/dip, drinks, etc. We'll eat. Take family photos. Then open gifts. Everything will be as it has in years past. Except that it won't. The first Christmas is supposed to be the hardest. Part of me wants to be happy and cheery. And I am excited for my girls. Yet sad too. They will never remember Christmas at MeMe's. We do have video of the past 3 years, so I can show them at least. All the holiday lights are shining bright, but I am not. It's just not the same. Holidays are all about family, and big part of mine is missing. How can I be happy when myheart feels sorrow? So many memories. It's a painful reminder that a whole part of my life is gone. Such a sad, bittersweet, Christmas this is for me. Valerie missed her first day of school today. It was a makup day from hurricane Gustav, and I doubt they were doing much. She's had a runny nose and cough for about 3 weeks now. Just lingering sinus crap, the same as we all have. Or so I thought! Sunday she spiked a fever and again last night. This morning she sounded like was hacking up a lung! And then there's this rash that appeared yesterday... The few times she's been really sick, she's had a speckled rash. It showed up yesterday. So off to the doctor we went. I almost cancelled the appointment because after she was up and about, she was FINE. Well, She has STREP! WTF? No telling how long she has had it. Not once did she ever slow down or even act sick. Not one indication she had anything other than a cold. I asked her over and over if her throat or ears hurt and she said no every time. It didn't seem like much of anything, so I just decided to wait it out. I'm not a nervous Momma who rushes to the doctor at every sniffle. So... Veronica is snotty and coughing as well. Looks like we'll be spending tomorrow morning at the doctor with her since there is a good chance Roni has it also. Lovely. How bad of a Mom am I?! I can't even tell when my babies are sick! Really sick!! I submitted my snow post to our local newspaper for a first snow article and they quoted me! And used a picture of me and my mom and just me. I was in the newspaper. Yay! The Morgan City newspaper, The Daily Review, does something unique with Santa letters every Christmas Eve. They print them. As written. Almost all of the elementary teachers do it as a class project and send in their class's letters. It's my most looked forward to section of the paper every year! It's pretty fun trying to decipher some of the requests. Some letters are so sweet and innocent. Some are just downright hilarious. And there's always a few that pull on your heartstrings. Thank you for the toys you brought me last year. Santa, this year I'd like a Baby Alive Go Bye Bye, roller skates, and a pogo stick. I want a horse and I want to ride it. And I will get hay from the store. Remember when I saw you in the mall and gave you a big hug? Please bring my sister a new butterfly rattle. Please bring my Mommy new make up brushes and my Daddy new tools. Santa, I will leave you some cookies and milk. Merry Christmas. I love you. Thank you for the toys you brought me last year. The Jack in the Box is my favorite. This year please bring me a new baby doll and a little bitty horse and a little pack of hay, and new shoes. Merry Christmas. How can it be four years already? Four years since I first held you in my arms. You were swaddled tightly in hospital blankets with the little striped cap on your head. Oh so tiny!! I wasn't sure what to do with you. I was in awe. You were so good, so quiet, and so sweet. How you changed our lives forever! How you changed ME forever. And here you are, four years old already. A little girl. You love to wear dresses - and the same dresses over and over! You're a Valerina! You're a princess! Make up and perfume are a special treat. Oh so girly girl. Yet so silly!!! You still love your bunny blankets. You can sing and dance. You go to school and dance class. Your friends are so special to you. So thankful for everything and so polite and so full of hugs and kisses and I love yous.... You love to help. You love to cuddle and read books. I couldn't ask for a sweeter little girl. And even after four years, I'm still in awe. Happy Fourth Birthday to Valerie Nicol! Love you!! Clint is on vacation until January! Yay! Thursday night we took the girls to Celebration in the Oaks. For anyone not familiar with it, city park in New Orleans is all decked out with lights. We used to go every year before the girls were born. This was our first time taking the kids, and of course they loved it. It's one of my favorite things about this time of year. My previous post got picked for Best of Holidailies. Yay! I have LOTS of pictures. Unfortunately my laptop with my built in card reader is off for repair. So, unless I can locate the cable for my camera to transfer the pics... they'll have to wait!! When I was 16, I received the Christmas gift that every teenager clamors for. My first car. My Mom had been toying with the idea of buying me a car for quite a while. I guess I grew up spoiled, because it was always understood that at some point I would get a car. It's no secret Mom and Dad were not hurting for money, so it was just one of those things we automatically started talking about when the time came. I just didn't know how serious my Mom was just then or when I'd get one. At some point we found a key chain with my name on it, so we bought it for 'my car keys.' And just held on to it for months. We looked through the used car ads on a regular basis and checked out anything of interest. I wanted a small car since it would be easier to learn how to drive. Yes, that's right - I didn't have a license and I didn't know how to drive, yet we were car shopping?! Most of the used cars were clunkers. Too much money, too many miles, too beat up. Being a typical teen, I didn't want to be seen driving a piece of junk! My Mom didn't want to spend a fortune on my first 'learning' car either. Then, we found it. We saw an ad for a 1984 silver Nissan Sentra. It was only four years old. It had 38,000 miles on it. It was clean and smoke free. And they were only asking $2800! I think my parents looked at it first. Then they took me to see it. And I liked it. It was small and me being so short, it was easier for me to see out of it. I got behind the wheel and idled down the street (haha!) to see how it felt. The next day or so, my Mom told me that they called the man to buy it and someone else had already bought it. I had an inkling of doubt because my Mom was well known for these types of fibs!! MANY times she's pretend to 'forget' or something was 'sold out' only as a deterrent. But then I kinda forgot about it and we kept on looking through the sale ads. Fast forward... I believe it was Christmas Eve. My Mom and I had gone to Canal Villere, a grocery store that has since shut down. The son of my Dad's co-worker was cashier there and we were on friendly terms with him. My Mom was busily unloading the cart and he turns to me and says, "Melanie, what's wrong with your car? I see it at the dock all the time." Or something along those lines. You see, my Dad worked at a fuel dock, and did all the maintenance on our vehicles during his free time in a big warehouse at work. I was caught way off guard when the cashier said this and mumbled, "Not my car?" And I clearly recall my Mom edging her way in front of me pushing me behind the cart, mumbling something, and changing the subject. Of course, it was too late. My wheels had started turning!! Could my Mom really have gotten me the car after all? Was the 'it's sold' another ploy to surprise me? Hmmm! I was on pins and needles after that. Just like a little kid waiting for Christmas! We opened gifts as usual that Christmas Eve. No mention of a car. After we all went to bed, I did what every nosy teenager would do. I got up and went digging. The only thing I could think of that would have some proof is my Mom's checkbook. And there it was. In the check registry she had written someone named 'Lipari' a check for $2800. The same amount as the car! I kept thinking, "OMG I can't believe she bought it! Did she really buy it??" Somehow I managed to go to sleep. I woke up reeealy early before dawn and looked out my bedroom window to find that my Dad's car was gone! There was only one place he could be. So I watched and waited. Before too long, I saw headlights. They turn into my driveway. And it's the car. The 1984 silver Nissan Sentra. I went back to sleep for a few hours. When I got up, there was a small wrapped gift under the Christmas tree. I tried to hide my excitement, because I wasn't supposed to know! But I did know!! I opened the box, and there was my "Melanie" key chain with a set of keys. My car keys!! And in the driveway was my car. My Mom had wrapped red crete paper around it and tied a red bow on the roof. Awesome. Later my Mom told me she had whispered to the cashier "I'm going to kill you!!" after he spilled the beans. I never told her that I had figured it all out. No one knew... until now. Maybe I'm the odd woman out, but I hate wrapping gifts. I always forget how much of a pain it is until Christmas. I usually try to wrap as I buy, but now that the girls are older that isn't happening. It's just aggravating to me dealing with the huge roll of paper, scissors, bows, tags, and tape. My Mom always told me I wrapped presents "wrong." I'm still not sure what she meant!! Something about how I sized the wrapping paper was "wrong." I was wasting paper. It's going in the trash anyway, so what difference did it make if we saved a few inches?! I can wrap a pretty gift with all the ribbons and bows. I just don't like to. Back in high school or maybe my first years of college, my Mom hounded me every holiday season to apply for a job as a gift wrapper at a local store. It was called Anthony's, which is now a Stage. Same type of store though. They offered free gift wrap and for some reason my Mom thought that was the perfect job for me. Never mind that I wrapped gifts "wrong." Never mind that I wasn't very good at it. And never mind that it was something I saw as a chore to do. I put in an application once that I recall at my Mom's persistence. It was too late though and all the gift wrappers had been hired. Whew! Now, on the other hand, unwrapping gifts ... that's another story! My Dad seemed so lonely today. He seemed sad and lonely. All alone at Christmas time for the first time in his life. He's always been the type who seemed not to care about the holidays much. But this year is different for him. For all of us. I have my girls to kee me busy. My Dad has no one. My Dad put up a tiny tree for Valerie and Veronica. It too seems lonely in the corner behind the rocking chair. No presents under it. No lights on. Just a tree. A sad little tree. Try them . You'll like them. Heat oven to 375 degs. Combine oil, egg, and sugar. Beat for 2 minutes. Sift 1 cup flour with baking powder, baking soda, salt, and spices. Add to oil mixture. Mix well. Mix remaining 1/2 cup of flour with fruit and nuts. Stir into mixture. Drop by tablespoons onto greased baking sheet. Bake 8-10 minutes until edges are golden brown. Yummy with a glass of eggnog!! This weather is so icky. It's chilly and damp. Humid. Foggy. Dreary. It certainly doesn't help my spirits any. The weather is BLAH and I feel BLAH. I can't decide if I'm hot or cold. Or if it's just the humidity making me feel damp and clammy. We saw snow last week, yet tomorrow it's supposed to be near 80 degrees. And of course we are all getting sick again. I'm stuffy and not feeling up to par. I was just sick for 3 weeks people!! I don't need it again. Both kiddos are coughing and congested. Val seems to be fine with it, but she's tough. Roni is fussy, but then again that is normal for her!! So it's hard to judge just how sick they really are. Roni's toe is still looking pretty bad. I tried to put a sock on her foot to go out today. "Ow ow ow" she cries. So she went out with one sock and no shoes. Then she managed to drop something else on her toe while I was baking and popped the blood blister. It bled and bled. It's gotta hurt. Poor baby's toe is ugly and bruised so bad. I feel so sad for my baby girl. Today I'm baking more cookies. Except these are the BEST cookies in the world. The best Christmas cookies anyway. I swear!! My Mom made these every year during Christmas week. She'd bake and bake and bake. Cookies, fudge, pralines, etc. She made an awesome coconut cake, and I hate coconut. Out of everything she made, these cookies were the bomb!! I made them for luncheons when I was working, and for some reason it took a lot of convincing to get some people to try them because they have candied fruit in them. But they never lasted very long... I made 2 batches today because they won't last long at my house either! And I made chocolate chip cookies for the kids. Plus I'm bringing my Dad some tomorrow. Next week I'll decide what other kind of goodies I want to to make. Gotta keep the family tradition going, ya know?? The party went well. It was nice and quiet and calm. Which is always a good thing. We had so much good food! Yummy. Everyone left much earlier than we expected, which wasn't exactly a bad thing either. My Dad spent the night here, so we were able to have a movie night with the kids after the party. Val slept in our bed though and kept me up all night kicking and talking in her sleep. Ugh! I can't believe it's almost Christmas. The year is almost over! I am hoping to feel better after the holidays have passed us by. Right now it's just anticipation and angst and sadness. Christmas is going to be so hard this year with out my Mom. I keep remembering last Christmas and how no one knew it would be her last. She was probably very sick at that point, and no one knew. Not even her. Or if she did, she never let on. Even now I think back and find it's odd she gave me her sterling silver flatware last Christmas. Why choose that year? It's been stored away in the chest it came in for many years. She already told me I could have it. It was mine anyway, but it was unlike her to wrap something like that and put it under the tree. Just another thing we'll never know the answer to. We're pretty busy today getting things together for our Christmas get together this afternoon. Lots of friends coming by and lots of food... can't go wrong with that! I'll be back around tomorrow with a real update. I woke up all stuffy this morning. Noo! I can't be getting sick again. I was just sick for three weeks straight. I have too much to do to be sick. Poor Veronica hurt her big toe. She was moving around these big cans of juice. I keep putting them in the pantry, and she gets them out. Well the inevitable finally happened. She dropped one on her big toe. Her nail is purple/black. She cried and cried. I was thinking it was broken for a little while. Finally she fell asleep and woke up happy. She's still going around 'ow ow toe' every so often. I think it is just bruised. Poor baby! Not much to write about today. We are busy getting ready for our Christmas party tomorrow. Cleaning and decluttering. There's not much to do, thankfully. I keep wondering why we do these things!! But then I remember I wanted to keep busy. And it's working. We're busy. Cookie swap and a busy day!! Today was the cookie swap for our playgroup. We started it a few years ago and it has become a holiday tradition. Everybody bakes about 5 dozen cookies and then we share them! It was lots of fun. We got to visit with friends, the kids played, and got to open a gift. I came home with a box of yummy cookies, too! It looks like we'll be shipping my laptop off to Dell for repair. One, the keyboard is missing the letter "A" thanks to the kids. Two, the power cord connection isn't working right. The battery doesn't charge all the way and on occasion I get a message telling me the power adaptor isn't recognized even though it is the one that came with my computer. So anyway, the warranty is up in a couple weeks so Clint finally contacted tech support. I have a desktop PC and Valerie has a laptop, so I won't be completely cut off! 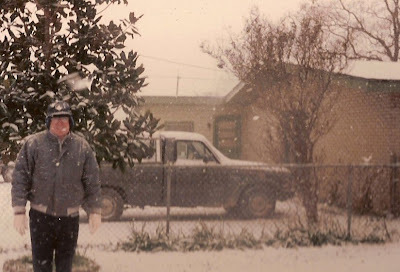 When I was 17 it snowed. To some of you that is no big deal, but to this Southern girl it was huge. 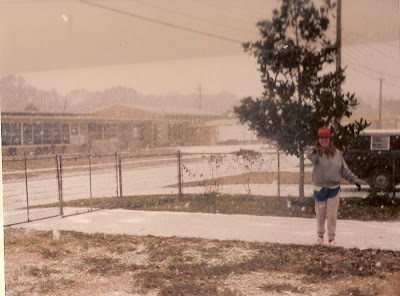 It was the first time I'd ever seen snow. The weather forecast had predicted possible snow flurries. We scoffed and said we wouldn't hold our breath! Snow? Here? Not likely. It was December 23, 1989. It was well below freezing and the sky loomed with dark clouds. My Mom kept saying "See how low they are? That's snow clouds!" To our surprise, mixed with the rain, we began to see teeny tiny white specs floating in the rain drops. Soon the rain stopped. Those teeny specks got bigger and fluffier. And it snowed. Really snowed, at least for down here. There were huge fluffy snowflakes falling all around. No one predicted it would be like this. It was beautiful! Unlike anything we had ever experienced. 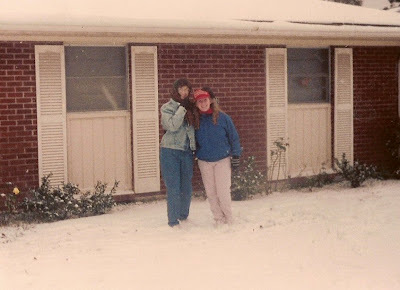 My Mom and I bundled up and ran outside because neither of us had ever seen snow like this before. Before long it began to accumulate. I can still picture my mom laughing and bouncing around outside like a kid. She was so excited. 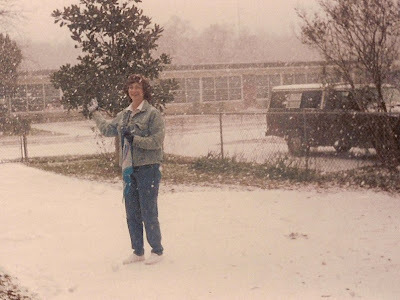 She scooped up a hand full of snow and tossed it at me! "That's what you're supposed to do," she said!! 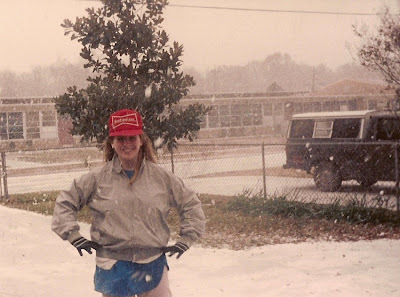 Thus began our first snowball fight. We soon learned that the powdery snow wouldn't stick together with out water to make a ball. It snowed for quite a while and we had something like four inches on the ground. I can remember going inside to warm up and change gloves because mine were soaked and my hands were freezing. The pipe to the hot water heater in the garage froze for the first and only time ever, so we had no hot water! Finally I put rubber gloves over my knitted gloves so that my hands would stay warm AND dry. 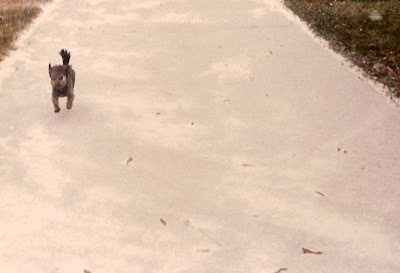 Our dog, Benji, ran up and down the driveway. 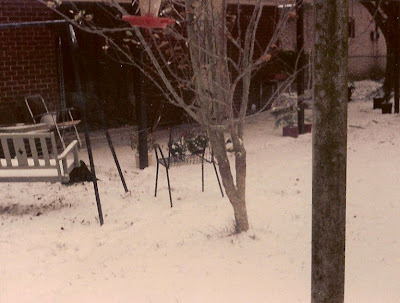 He loved the cold and was so frisky for an old dog. He looks like he's flying in the pictures. My Mom and I managed to scrape up as much snow off the lawn as possible to build our first snowman. We had to add some water to make the snow stick together! 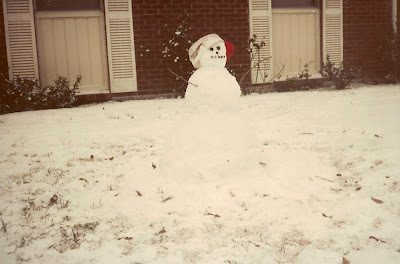 What a pitiful snowman he was, but we didn't think we'd ever have a chance to make one again. The next morning most of the snow had started to melt. What a sludgy mess that was! It was Christmas Eve, and my Dad and I decided to go to Wal-Mart to buy my mom a VCR. The four lane bridge was closed due to ice, but the two lane was open. I drove my little Nissan, and I can remember my Dad and I sat in traffic for what seemed like hours waiting to cross the bridge. We did make it to the store eventually to get that VCR. And that is the first of two White Christmases I've experienced so far. The next time it snowed? December 25, 2004. Valerie was 4 days old. Wonder if it snows in Heaven? Hope so, Momma. Hope so. Well, I'm waiting for the snow to start! Weather.com is showing a chance of snow mixed in with the rain tonight and early tomorrow. I'm not holding my breath, lol! It is much too dreary and cold to go anywhere today. Valerie has an icky sounding cough, but isn't acting sick AT ALL. So, we are staying home to bake COOKIES! Friday is our cookie swap, so I decided to start baking today. Valerie is being a great helper. We actually managed to cut out, bake, cool, and decorate all while Veronica was napping! Tomorrow we'll bake batch number two. Valerie had dance class last night. She loves her class so much and I'm glad I decided to enroll her. For a while she asked every day if she was going to dancing. Every time we pass the school she waves "Hi Dance Class!!" Sitting there watching her follow along at class makes me proud, but sad too. I went to dancing for years. My Mom brought me and usually watched. Of course she went to every recital and every rehearsal. My Mom would be thrilled to see Valerie dancing. We talked about finding a class for Val often. My Mom would have loved to see Val on stage for the recital in May. Today was pretty uneventful. I brought Valerie to school. Veronica and I came home and I did some housework. I addressed all my Christmas cards! Now to get stamps and drop them in the mail. Every year I say I'm not sending out as many cards but then I end up with a stack anyway. We'll probably receive like 5 cards and I'm mailing out almost 40. Why? I don't know. I had an endocrinologist appointment at 1:30. Just a routine thyroid check up. I had no clue what to do with the kids! Luckily Clint was working in town today. I brought Veronica to him at his office (yeah that's right - babysitting at work!). Then I took Val with me to my appointment. My Dad would have come if I asked, but the weather was supposed to be bad and I know it is hard for him to keep up with both kids. Anyway, doc said everything is OK but depending on how my blood work comes back he may increase my meds. Maybe it'd help me lose the 10 lbs I've been trying to drop for over a year!!! We're also gearing up for party #2. A Christmas party this time. It should be pretty simple. Just a social event... come by whenever, eat, visit, drink, and stay however long you'd like! And I gotta decide on a cookie recipe. I need 5 dozen cookies for our cookie swap on Friday! 3:20am we're sleeping. "DING DONG DING DONG DING DONG DING DONG!" goes the door bell. What the hell?!? Clint bolts down the hall. I couldn't imagine who was at the door - obviously thinking something terrible has happend. Clint looks through the door - no one there. Looks out the window - no one there. We notice some lights come on then go off down the street. So we figured someone was going house to house ringing the bell. We called the cops but I doubt if anything came of it. So anyway, I got up at 6am and got Clint up at 7am to get the last minute party things together. We didn't have much to do, and I don't like to be rushed so I wanted to get things done early. The bounce house people got here to set up about 10. Valerie was SO happy to see princesses on her bounce house! My Dad came over a little early. The party went great! Every family we invited came. It was so cute seeing Valerie sitting behind her cake while we sang Happy Birthday. She sweetly closed her eyes for a second (make a wish!) and blew out her candles. No crying as in the past couple of years because she was scared of the candles (weird!) It was a great day for my little girl. Today I went to the gym only to find the babysitter was out sick. Since we were on that side of town, I took the kids to the Dollar Tree. Valerie has a chore chart, and once she got 10 stickers for helping I told her she'd get a toy. Well she has 9-1/2 stickers, so I figured we were there so it would save me a trip later!! I also let her choose gifts for Veronica, Clint, and my Dad all by herself. She picked the funniest things, but I guess to her it makes sense! The party went rather well! Valerie had a GREAT day!! I think everyone else enjoyed it also. To my surprise, every single family we invited attended. Yay! Here's a few teaser pics for now. (cake too) I'm exhausted and the house is a complete MESS. I guess RSVPing has gone out of style or something. No response means....... yes? no? maybe so? Anyhow, tomorrow is Val's big 4th birthday party. I tried to keep her party smaller this year. No inviting people just because. I only invited kids that Valerie knows and plays with. After all, it is HER party. Val's actual birthday isn't until the 21st, but with Christmas right around the corner it seems to be a little better to have her party a few weeks early. Heck, in a couple years we may decide to start having a November party for her. December is just so busy. And I know people complain about having to attend a birthday in the middle of holiday chaos. Buy my sentiments are if it's too much trouble, don't worry about it. It's not like we chose for our child to have a Christmas birthday!!! I bought Valerie a Baby Alive Learns to Potty doll for her gift. If you ask her what she wants for Christmas, that doll has been at the top of the list for months. After reading the reviews though, I was on the verge of returning it. For one, it wasn't cheap! And some reviews say it is too complicated for a 4 year old. I remember having a Baby Alive when I was a little girl and she was my fav doll! After thinking about it, I wrapped it up anyway. Val has wanted this doll for a while, and I know I will feel bad knowing I HAD it and decided to keep it from her. I finished Val's cake today. You'll have to wait until tomorrow for pics though!! No peeking before the party!! Clint pressure washed the back porch. We cleaned up inside.... I think we're all set and ready to go!! I'm excited and happy for my little girl. But those clouds are still there. I just wish my Mom were here. Clint was supposed to go play golf today, but at 8am he decided since it was 34 degrees it was too cold. ha. Can't say I blame him! We were busy around the house all day. I cleaned the back half of the house - even the kids' rooms! I started Val's birthday cake (pictures to come!) I'm glad I decided on an easy, simple cake this year. I love to bake and it's not hard, but it just takes so much time. And I'm not a neat baker, so there's always spilled sugar and such to clean up afterwards! I'm just not in the mood to do any fancy baking anyway. Cake supplies ready! and yes I use a mix, but I have my secret ingredients to make it better! Tonight was our Ornament Swap/Mom's Night Out (MNO) for the playgroup I belong to. I almost didn't go. I was having a bad night and lost my motivation to leave the house. I went anyway though hoping I would feel better if I went. I don't know if it helped much. I did get a beautiful angel ornament in the swap. It didn't cross my mind until I got home that my Mom loved anything with angels on it. Maybe I got it for a reason. I don't know if that is supposed to make me feel better or worse. My name is Melanie. I live in a small town called Bayou Blue in south Louisiana. My husband is Clint (married 2/14/03.) He travels a good bit for work. I'm a SAHM of two girls - Valerie (almost 4) and Veronica (1). 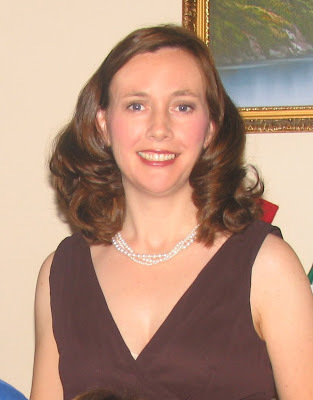 Before I was a mom, I worked for 11 years for the same company! I left my job to stay home with Valerie. The girls take up a lot of my time, lol!! I enjoy working out, cooking, baking, cake decorating, and spending time with family and friends. This is my first attempt at holidailies, so we'll see how well it goes!! It has been four months since you've been gone. Four lonely, sad months. It still does not seem real at times. I wonder if my days will ever feel sunny again. Every day is clouded by memories and thoughts of you. Every day I'm haunted by the images and events of the last 3 weeks of your life. It just didn't seem possible that you - YOU - could become what you did. From learning how sick you were, to your dying just three weeks later... It was a nightmare. You must have been in horrible pain for months, but you never let on just how bad it really was. You just trudged on with rarely a complaint. If only one of the many doctors you saw would have put two and two together, maybe you would have had a little more time. I know death is part of the circle of life, but I still feel you were taken from me well before your time. Everyone was shocked to learn of your passing because you were so healthy and so strong. No one ever thought of you sick or dying. I always pictured you aging into an old woman. Everyone keeps saying it will be okay. I don't see how I will ever be okay. I don't know what to say when I'm asked about the holidays. Do I smile and say everything is fine or do I tell them I'm sad? Do I tell them WHY I'm sad? I think of all the years that lay ahead and life feels so lonely with out you. Valerie still talks about you. I wish you were here to see how big Val and Roni are. I hope that you are at peace now. P.S. I haven't found any pennies lately. So, I've signed up over at http://www.holidailies.org/ . Basically by participating you must update every day for a month. We'll see if I succeed or if I fail miserably. Kick off is December 5th and it ends January 6th. Going with the usual weekend after Thanksgiving tradition, we took our Christmas card pictures today. How I got the girls to smile at "no one" (remote control camera!....) I'll never tell! But it worked and I will do it again! Thanksgiving was nice. I was very thankful that we didn't have to spend the day alone. My Mom's absence would have been more painful if we had sat at my table with an empty chair. We spent the day with friends and had a fantastic Thanksgiving meal. Being out of the house for most of the day kept my mind occupied, but I did have a hard time once we got home. Too many memories. Too many things -- gone. I wore one of my Mom's shirts today. Some of her jewelry too. And of course I made her traditional broccoli, cheese, and rice casserole. Happy Thanksgiving everyone. Enjoy your day. I know I have lots to be thankful for. I just doubt it will be happy. It will be a very hard day. My heart hurts so much. I miss my Mom. After being sick for nearly 19 days, I am finally starting to feel better. As Clint put it, I am just really run down. I hope I can find the energy to get through the next several weeks. Thanksgiving... Val's party... our Christmas party.... Val's birthday.... then Christmas... then New Year's. It's all a lot of work. Plus numerous comitments in between and I need to finish my shopping some how. I'm having second thoughts about my 'busy is better' theory. Right now I just don't care to do anything. Go Iguana .... "GO" ?? *I've been sick for sixteen days and counting!!! Can't seem to shake this sinus thing. I'm so stuffy and can't breathe. It's worse at night. If it's not better by Monday I guess I will go to the doctor. *Veronica has been sick for a few days too. *We put up our Christmas tree yesterday. The kids have already pulled all the ornaments off the bottom. *Valerie helped decorate the tree and insisted on putting the same ornaments grouped together. *Tree looks terrible but I don't care! *Val made Clint put the lighted reindeer and inflatable Santa in the yard. Then she cried and cried because she couldn't "see Santa's smiling face" from the window. Aww. *Veronica is suddenly talking up a storm. It's mostly babble, but she's saying 2-3 word sentences here and there. I've noticed she does it more when Valerie isn't around. *Last night I went to Olive Garden for Mom's Night Out. It was so fun and so nice to get out with no kids. I was feeling pretty bad towards the end though and left earlier than I normally would have. *Sometimes I think I'll be ok. Then others it feels my heart is shattered into a million pieces. *It's funny how people you thought you could depend on prove you wrong. Then others that you never dreamed cared, really come through. *I've finished shopping for Santa and all of the kids I needed to buy for. Now to figure out Clint and my Dad. I am feeling really overwhelmed with the fast aproaching holidays. Thanksgiving is next week?! I don't even want to think about it. It feels like the holidays are aproaching fast and I feel so unprepared. I know it's going to be difficult and full of memories and bittersweet moments.... I am almost done shopping for Valerie and Veronica. There are two more things I need to grab at the mall, and my Santa gifts are done. I'll just need a few things to wrap for under the tree so that they have gifts to open on Christmas Eve. It's everyone else that I want to get something for that baffles me. Clint and my Dad are the only two adults I need to shop for, and I'm clueless. Clint... I have a few things in mind, but it's to find it. But what on earth do you buy a rich old man? I can't seem to focus. I am not motivated at all. I just feel so overwhelmed just thinking about going from store to store looking. I can't even bring myself to browse online. It just won't be the same this year and my heart isn't in it. Valerie's class is on the letter H this week. Today their H theme was "What makes you happy?" Valerie's answer: My MeMe and Poppi. Veronica loves looking at photo albums. She's constantly pulling my albums off the book shelf and flipping through it. I'm cleaning the living room today, and Roni grabbed a book with very old pictures in it. All of a sudden she gets so excited! She laughs and laughs, and says over and over, "MeMe!! MeMe!! MeMe!!" as she points to a very old photograph of my Mom and Dad in Biloxi, Mississippi.